In 2010 and 2011, Holly Griffin was a university student in Christchurch. When the earthquakes hit, they disrupted her life. But they also represented an opportunity for Holly to work in the humanitarian space, something she’d always wanted to do. Video: Holly discusses her role as an aid worker as part of the psychosocial recovery team in Fiji. We talked to Holly about being an aid worker, and heard her words of advice for people considering applying for this year’s IMPACT training –a Red Cross course for people wanting to become aid workers. During the Canterbury earthquakes, Holly volunteered for New Zealand Red Cross and worked in the psychosocial recovery team; helping people who were going through emotional distress after the earthquakes. 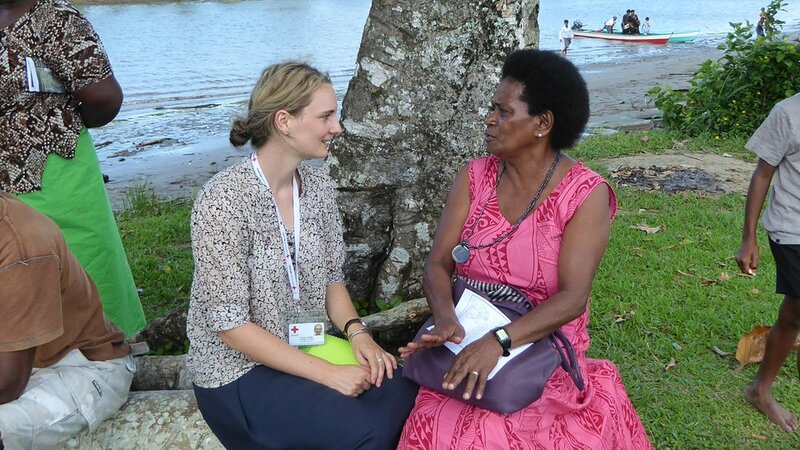 Four years on, Holly is now an aid worker in Fiji, helping communities there recover from Tropical Cyclone Winston, which disrupted people’s lives and livelihoods in February 2016. It’s the lessons learned during the Canterbury earthquakes that have put Holly in a good position to help others in the Pacific. “Here in Fiji, I’m working for the Winston cyclone recovery and response team. I work closely with Fiji Red Cross as the psychosocial support aid worker. I help them train their volunteers and staff in psychological first aid – how they can sit and be with people, and help them walk on the road to recovery. “After a disaster it’s easy to see the physical destruction, it’s not so easy to see the emotional wounds that people have. Houses are more than just wood and iron, bricks and mortar – they’re people’s homes, where people have built memories. Even after we’ve put back the walls and the roof and cleared away the debris, people still have emotional responses to overcome. “The emotional recovery can be a lot longer than the physical recovery and can be needed three months, six months, or longer, after the initial disaster. Having Red Cross here to provide care is an important role in recovery,” Holly says. Read more about becoming an aid worker and apply today. Through training volunteers to provide emotional support for their communities, Red Cross has reached hundreds of people in Fiji. One of these people was 75 year old Makarita Racani, who watched her house be swallowed by the sea during the cyclone. She spent hours in an evacuation centre, her feet in water, listening to the howling winds and watching window panes shatter. The cyclone had a lasting emotional impact on Makarita, but being visited by volunteers has helped her move forward. “I feel relief, because I know that I shared everything that was in my heart from the cyclone,” she says. Why be an aid worker? For Holly, helping communities recover from disasters is one of the most rewarding roles she’s had. We’re currently recruiting aid workers for this year’s IMPACT training course. We’re looking for people with skills in water and sanitation, IT & telecommunications, development and recovery, disaster management, shelter and construction, logistics or community health. Applications for this year's IMPACT course (to be held 7 to 14 October 2016) close on 15 August 2016. Applications received after this date will be considered for the 2017 IMPACT course (to be held 6 to 13 October 2017).